Sometimes, a solid performance makes a movie worth watching. Case in point: Bill Murray, who portrays President Franklin D. Roosevelt in this charming little movie that takes place in the summer of 1939. The story focuses on Roosevelt’s distant cousin Daisy Suckley (Laura Linney) and her relationship with the President. Director Roger Michell imagines what may have happened between the two based on fragmented diaries and intimate letters that were discovered under Daisy’s bed when she died at the age of 100. The idea is to show that F.D.R. had not just a fondness for her but an actual relationship, while carrying on with his secretary Missy LeHand. This is certainly interesting but also disturbing at times. Some might object to the sweetness Roger Michell brings to the unlikely romance between the married President and his distant cousin. 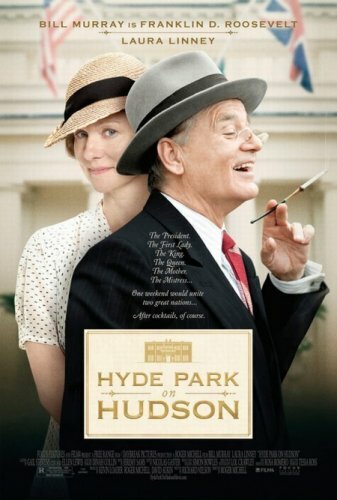 But Murray and Linney have charm to spare and the no-bull instinct to cut to the heart of a scene.The overall result may not be excellent, but in the face of Murray’s magnificence, it’s impossible to dismiss “Hyde Park on Hudson” as a flop. The movie is fun to watch, so enjoy it for what it is.